Of course, nobody believes that jive, especially the people who just got pink slips last Tuesday. Yo, Zombies - if you have an "Agreement" that guarantees there will be no layoffs, then why do you need to "continue our member-driven campaign to fight them"? There's only one answer to the above question: It is Zombie UHW who is responsible for those pink slips going out the other day in the first place! This can be seen from the actual agreement that was signed on August 4, 2009, by some of the representatives of the Coalition of Kaiser Permanente Unions. That's right, "some." In fact, there are 16 CKPU members in California, but only FIVE of those unions signed off on this agreement, those being USW, OPEIU-30, OPEIU-29, UNAC, and of course Zombie UHW. Of those five signatories to this agreement, one organization has a level of membership that trumps all others, and that is Zombie UHW. Had Zombie UHW walked away from this "Agreement" and instead insisted that the contract be lived up to as signed back in 2005, then there would have been no pink slips!!! There would be no need for pickets or protests. There would be no need to brag about a guarantee of no layoffs on one part of a flyer, with a pledge to continue to fight the layoffs that have been guaranteed that would not occur. Damn. Now I've got a headache from trying to follow the Zombie UHW rhetorical spin. ZOMBIE UHW IS RESPONSIBLE FOR ANY IMPENDING LAYOFFS. 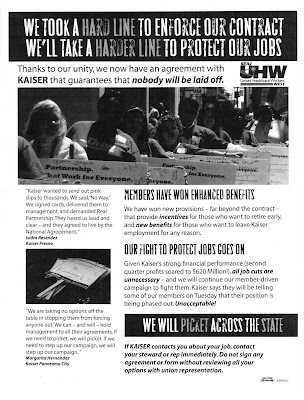 ZOMBIE UHW ENTERED WILLINGLY INTO AGREEMENT WITH KAI-PERM TO LAY OFF EMPLOYEES EVEN THOUGH THERE WAS AND IS NO FINANCIAL NEED FOR KAISER PERMANENTE TO DO SO. ZOMBIE UHW IS LYING TO ITS MEMBERS WHEN IT SAYS IT CAN GUARANTEE THERE WILL BE NO LAYOFFS, BECAUSE PINK SLIPS HAVE ALREADY GONE OUT, AND TRANSITION POSITIONS HAVE ALREADY BEEN ELIMINATED! Folks, wake up. You are not being served by SEIU; instead, we are all collectively being SCREWED by SEIU.